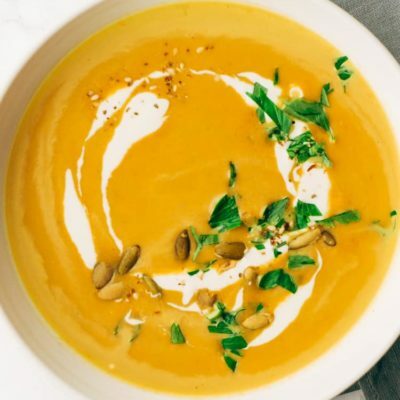 A comforting easy pumpkin soup recipe made with simple pantry staple ingredients. 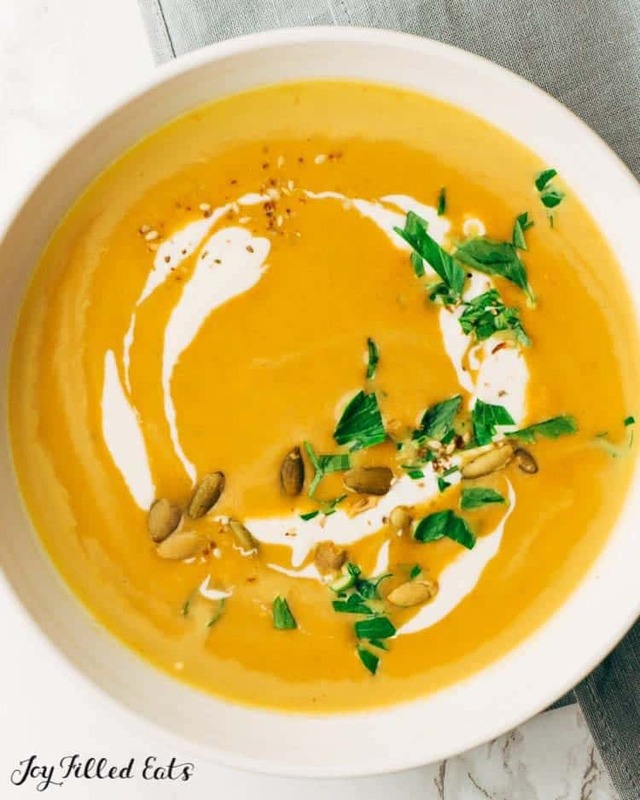 This pumpkin soup is a cinch to make and so, so, delicious! Hey there, it’s Sarah from Green and Keto back with one of my favorite low-carb pumpkin recipes. My family loves this recipe because it tastes amazing, and I love it because it takes 10 minutes (and just a handful of ingredients) to make. To me, the start of changing leaves and cooler weather means it’s time to break out my stash of soup recipes. There’s just something about it — I love making soup in the fall and winter months. 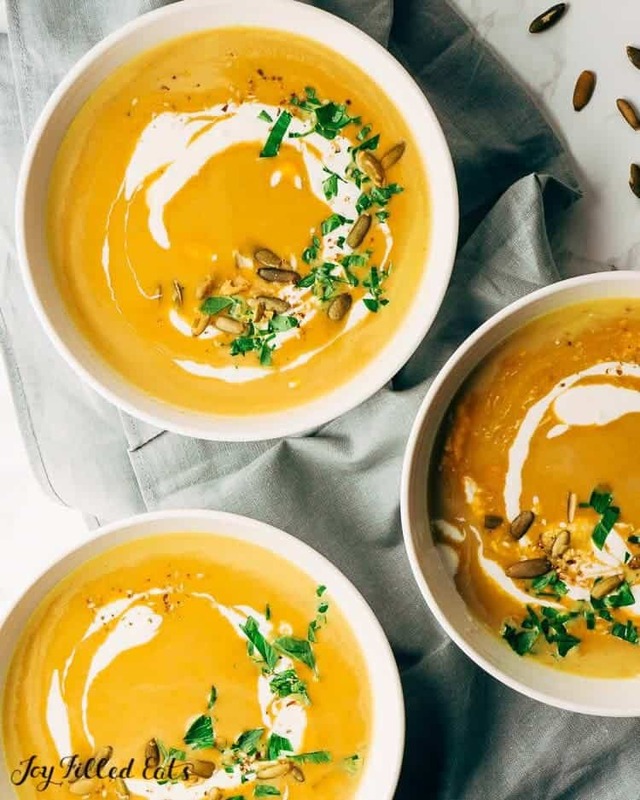 This easy pumpkin soup recipe makes a regular appearance on our dinner table this time of year. It’s warm and comforting, full of delicious pumpkin flavor, and a snap to make. You can serve this soup to start a holiday meal, but it’s equally at home with a sandwich or salad for lunch. What better way to serve a leftover Thanksgiving turkey sandwich than with a side of hot, steamy, pumpkin soup? Is Pumpkin Keto Friendly? Yup. Check out this post for more info! 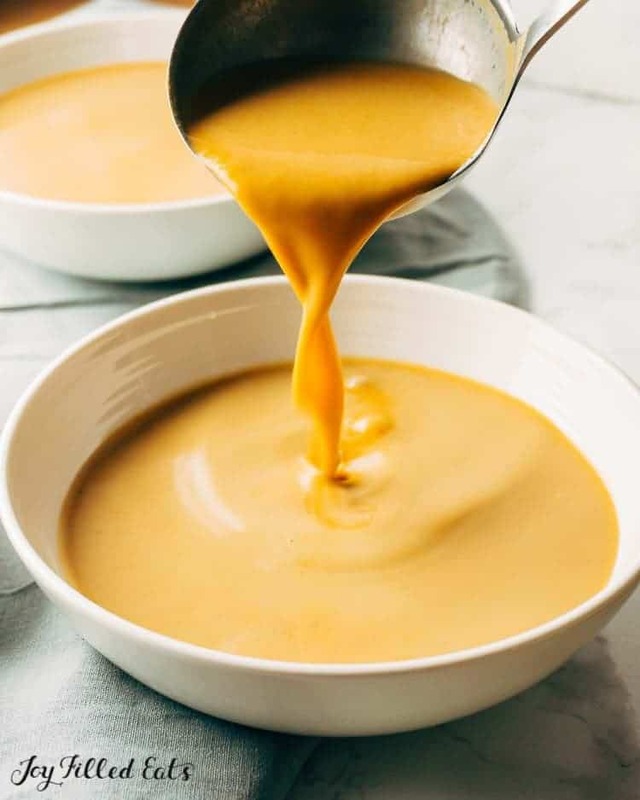 This pumpkin soup is super creamy thanks to the pumpkin puree and a generous splash of cream. It’s flavorful too — I like to add garlic, fresh thyme, and a pinch of cayenne pepper for a little heat. To make this soup extra convenient, you can use canned pumpkin puree and ready-made stock. I tend to have those ingredients in my pantry. But if you have fresh pumpkin puree and homemade chicken stock — well, then that’s even better. To garnish the soup, I like to add a swirl of sour cream or Greek yogurt, a sprinkle of fresh parsley, and a handful of pepitas. If you haven’t heard of pepitas before, they’re just pumpkin seeds without a hull. You can buy them already roasted and salted in most major grocery stores. Pepitas are a delicious snack or a crunchy topping for all kinds of recipes. 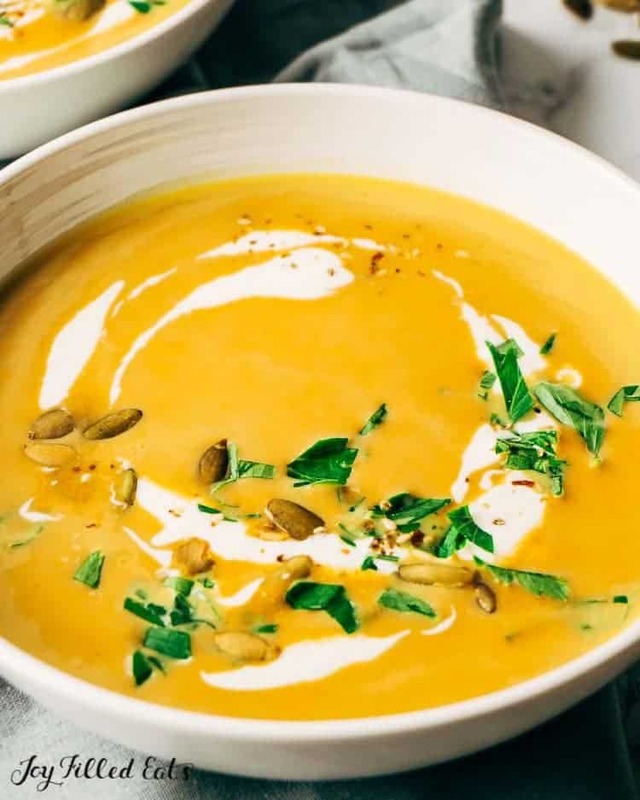 You can even make this soup with homemade pumpkin puree. To make freshly roasted pumpkin puree, first, preheat your oven to 350 degrees. Cut a sugar pumpkin in half and clean the inside cavity of seeds and strings. Brush the cut sides with oil, and bake cut-side-down on a baking sheet for 45-50 minutes or until a fork easily pierces the skin. Then, remove the pumpkin from the oven and let cool for 10 minutes. Peel away the skin, and mash the pumpkin flesh. For an even smoother puree, you can blend the cooked pumpkin in a food processor. One of the best things about this recipe is that the leftovers taste even better the next day. Soups tend to taste even better once the flavors have had time to mingle. So, you can certainly make it a day ahead of time, store it in the refrigerator and reheat it when needed. Remember, because there is heavy cream in the soup, a gentle reheat over low heat is best. Likewise, it is generally not recommended to freeze soups with cream. Creamed soups sometimes separate when you defrost and reheat them. So, what you can do is cook the soup without added the heavy cream if you know you are going to be freezing it. Then, you can simply add the cream after you’ve defrosted it. If you like to dip something into your soup (don’t we all?) these Low Carb Tortillas go perfectly with Pumpkin Soup! 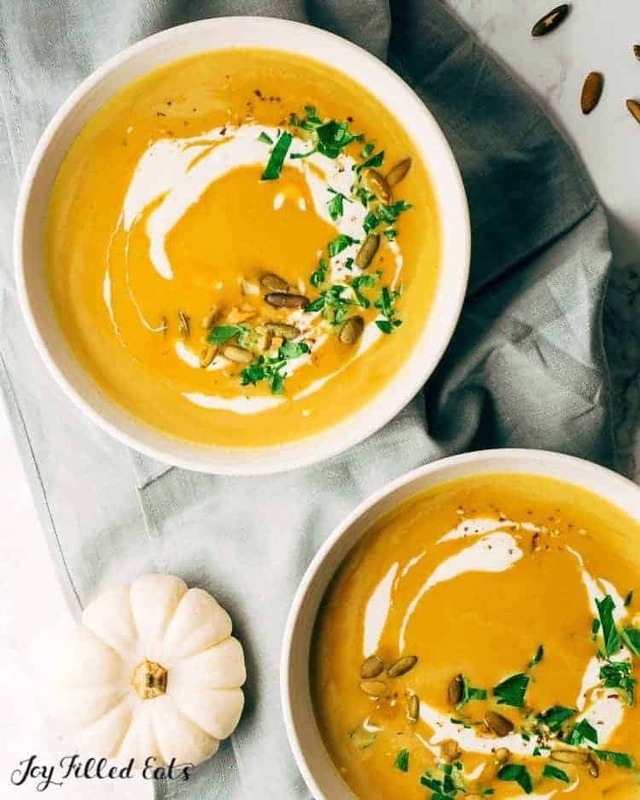 An easy pumpkin soup recipe that's keto friendly, low-carb, and gluten-free. Add the pumpkin puree, chicken broth, salt, pepper, garlic, and thyme to a medium saucepan. Stir to combine. Bring the mixture to a boil, then reduce heat and simmer for about 10 minutes, to give the flavors time to meld. Remove from the heat, and add the heavy cream. If desired, garnish with sour cream, parsley, and pepitas. This looks like such a yummy recipe! I was looking for a keto recipe that was quick so I could have lunch on the rush. But as I went through my fridge I realized I had everything but the heavy cream. I'm going to stalk down whoever used my heavy cream! I know that heavy cream is important for making soups, so I will make this another time. Thanks for the easy pumpkin soup recipe though, it looks so delish. My mouths watering! Could I swap out frozen butternut squash? Butternut Squash is carby. If you're following Keto it would make it pretty carby I think. If you're following Trim Healthy Mama it would make it a crossover (unless you swapped the cream for cashew or almond milk and omitted the sour cream and pumpkin seeds -- maybe use 0% Greek Yogurt instead or sour cream?) If you just want a delicious soup, sure I think that would work. I don't know about frozen though. I've only made this with thawed pureed pumpkin. Is it still Keto friendly if I use fresh roasted garlic and half a roasted onion? I don't know the macros for garlic and onion off the top of my head but I think it would be. I made this with cashew milk instead of cream, making it a fuel pull so I could eat it with toast. So yummy!! Could I use whole milk instead of heavy cream? I'm just not sure. You could but whole milk isn't keto. It has too many carbs. How is this low carb? Every time I put the ingredients into myfitnesspal the carbs come out to be a lot more because of the pumpkin purée. It is a really tasty soup though! I just checked in MFP and they were adding 145 grams of carbs for the 1/2 tsp garlic powder. That can be the problem with user data. Someone messed up entering garlic powder. When I changed from 'generic garlic powder' to 'McCormick garlic powder' it dropped to 1 gram of carbs for the garlic powder and the nutrition facts are almost identical to mine. Glad you enjoyed it! Yes, I think so. Add the cream before serving, not at the beginning.